A must-have for newly independent readers and fans of Ivy + Bean and Clementine! The first of a new series starring three young girls and a mysterious visitor who appears exactly when you need her—with just the right amount of magic. Sadie has two best friends: Jess and Maya. But Jess can only take one friend on vacation with her, and Sadie is the one who gets left behind. 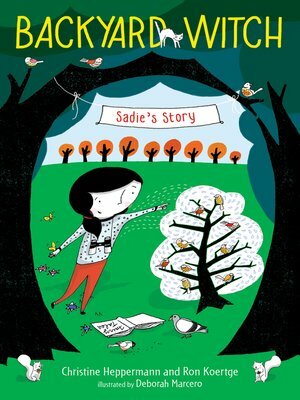 How will Sadie ever survive the days of loneliness and boredom? But wait . . . what is that in her old playhouse in the backyard? A witch has moved in! A kind and funny witch, who's looking for her own two lost friends. Together, Sadie and the witch have a curious adventure, one that makes Sadie see her neighborhood—and herself—with new eyes. Acclaimed authors Ron Koertge and Christine Heppermann—writing together and for younger readers for the first time—have created a heroine to rival Mrs. Piggle-Wiggle and Ms. Frizzle. Short chapters, a satisfying mystery, gentle humor, magical dazzle, and adorable black-and-white illustrations throughout by debut artist Deborah Marcero make this an ideal pick for readers of Ivy + Bean, Just Grace, and Kate DiCamillo's young novels.